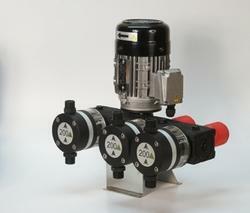 Prominent & Leading Manufacturer from Bengaluru, we offer multifertic injection pump. In order to fulfill the ever changing demands of our clients, we have been engaged in offering a quality range of Multifertic Injection Pump in the market. Developed using optimum quality raw material and advanced technology, the Multifertic Injection Pump offered by us is known for its high performance and easy installation. The range of products is widely appreciated by the customers for their unique features. Upto four different modules can be added, which can be piston, diaphragm or both.